Is There a Cost-effective Way of Mixing Concrete in Small Batches? Mixing concrete is key to many construction projects. It’s the starting-off point. A project’s foundation. The beginning of something great. Still, the seemingly simple task can sometimes feel as if it brings more headaches — and out-of-pocket expense — than it’s worth. At T&T Construction, we’re all about making life better for those we serve. We are proud to say that, yes, there is a cost-effective way to mix small batches. Our volumetric mixers can help. Our Taylor Made volumetric mixers allow us to travel to your jobsite and create custom blends on-site. Need a stronger mix for roadways, sidewalks and the like? We’ll formulate a batch with added cement. Whatever your needs, our volumetric mixers will help you get there. The best part? You’ll never find yourself paying for unused material that goes to waste. Because we’re mixing your concrete right there at the worksite, we’re making the exact amount it takes to get the job done. No more, no less. 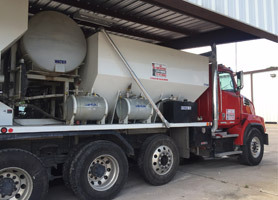 Want to know more about T&T’s volumetric mixers and all the ways we’re here to help your crew? You can see our truck in action, and even shoot us a message, on our Equipment page. Prefer to give us a ring instead? Pick up the phone and call 713.477.6660. We’ll get the ball rolling on your next big project. We’re looking forward to serving you.